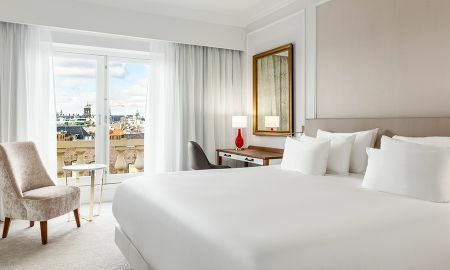 Right in the heart of the city centre, the NH Collection Amsterdam Doelen hotel is one of Amsterdam’s oldest and finest five-star hotels, dating back to the Golden Age. Over three centuries, it has hosted royal and legendary guests including Empress Elisabeth of Austria and the Beatles. Rembrandt’s ‘Night Watch’ was painted to display within its walls. Newly renovated in 2016, all rooms share a design theme off classical tones, mixing cream, red and gold accents. From standard rooms to palatial suites, each room combines luxurious indulgence with sleek design. The hotel benefits from an on-site restaurant for breakfast, lunch and dinner. Just sit back and take in a view of the Amstel river as you enjoy your breakfast. The chefs will be happy to prepare hot dishes on request. And if you are starting the day early, enquire at reception about the early bird breakfast. Guests can relax in the lounge or enjoy refreshments at the on-site bar. A free cheese and wine tasting is offered every day between 18:00 and 19:00 hours including one glass free of charge and history story telling about the hotel and the city. Valet parking is also available. Weekends will be endless with breakfast open until noon and complimentary late check out on Sundays. The hotels staff will take care of you and your luggage until you want to leave. Available upon request at booking, check-in, or during the stay. 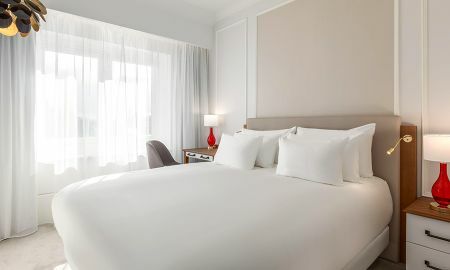 The 5-star NH Collection Amsterdam Doelen is situated along the Amstel River. Dam Square is just a 10-minute walk away.